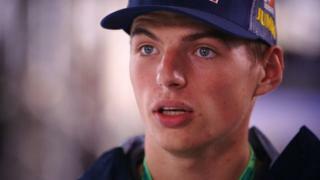 Is Max Verstappen ready for F1 at 17? Max Verstappen talks to Lee McKenzie about his future in Formula 1 after being confirmed as the youngest driver in history. The Dutch driver, son of former F1 driver Jos, will be 17 and break the record for F1's youngest ever driver by almost two years when he makes his Formula 1 debut for Toro Rosso next season. The youngest driver to earn a Championship point is Toro Rosso's Daniil Kvyat, who was 19 when he finished ninth in this season's opening race in Australia. The Russian will be Verstappen's team-mate in 2015.